My study guides have helped CCNP candidates earn their certifications for over 10 years - and now I'm ready to do the same for you. 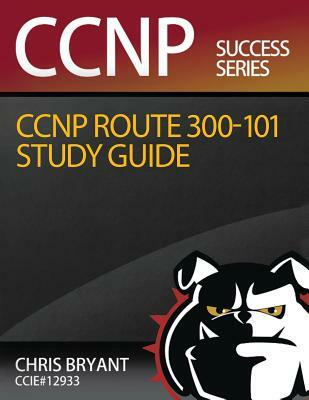 "I love Chris Bryant's CCNP ROUTE Study Guide It gets straight to the point and avoids the annoying technobabble. He brings it down to a VERY readable level for everyone and covers everything under the sun." "Out of all the CCNP ROUTE material that I have, I must say, this is one of the best, if not the best, CCNP ROUTE study guides out there. The instructor, Mr. Bryant is extremely sharp at explaining complex topics about the CCNP ROUTE exam." "Along the way I have read textbooks by Todd Lammle, Cisco Press as well as others. The CCNP Route study guide explained concepts that I found difficult to grasp, compared to similar lessons covered by other authors." With my clear, comprehensive, straight-to-the-point illustrated lectures, and plenty of real-world labs, you'll be better prepared for the CCNP ROUTE exam than you ever thought possible.